With the New Year, our first film review brings us The Hateful Eight. Although I am not a huge fan of Quentin Tarantino, I do respect his work and the product he produces on the big screen. This film was a must see for me and I was quite pleased with the outcome just like I have been with all of Tarantino’s films previously. 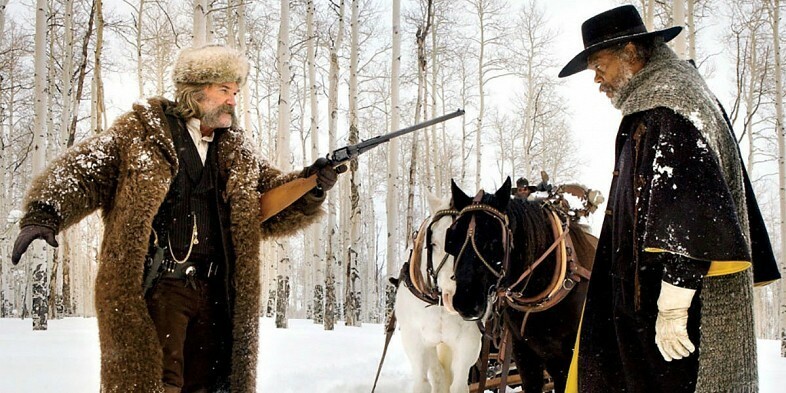 The Hateful Eight brings a Tarantino original style with a suspense-fully unique story. Love him or hate him, Tarantino continues to leave his positive mark on the film industry, The Hateful Eight is no different, which is depicted in my review. In post-Civil War Wyoming, a well-known bounty hunter named John “The Hangman” Ruth (Kurt Russell) races for the town of Red Rock to cash in his reward for his prisoner Daisy Domergue (Jennifer Jason Leigh). The Hangman is very reluctant on taking chances in jeopardizing his prize and will do whatever it takes to see Domergue at the end of the rope. Along their journey, a respected war veteran and bounty hunter, Major Marquis Warren (Samuel L. Jackson) crosses paths with the two and hitches a ride. Like Ruth, Warren isn’t so trusting. The party doesn’t stop there as the company then picks up an odd fellow, Chris Mannix (Walton Goggins) claiming to be the next Sheriff of Red Rock. The stagecoach races on for shelter, attempting to outrun a terrible winter blizzard barring down on them through the mountain pass. The unlikely group seeks refuge at Minnie’s Haberdashery, a tavern in the pass, where they are greeted by four mysterious strangers. Each traveler soon learns they might not make their destination. Tarantino is one of those directors who usually has trusted friends and previous actors from his other films casted in his next big picture. The Hateful Eight is casted by a few new faces and several familiar Tarantino originals. For me, I really enjoyed each actor in this film. Everyone played their roles in my opinion perfectly. Leigh was excellent for her sick and twisted role, she was defiantly a highlight. Goggins performance was a bit surprising. I wasn’t much of a fan of him in other films, but he left a good impression on me in this one. I didn’t see any weakness in the acting, but there was a few things I felt could be improved slightly. The film runs rather long. At a staggering 3 hrs and 7 mins, The Hateful Eight can seem a little stretched out. The story felt a bit back loaded where a majority of the action is left in the conclusion. This doesn’t take anything away from the unique western style and modern Tarantino twist. This film is packed with violence, profanity, and racism, it is not recommended for children. However, I do feel it is very entertaining and I should be on your list to see in the theaters. The cast and director of The Hateful Eight have delivered a fantastic film which has made a huge splash similar to Django Unchained.